Fig 1. Hollowed pigment grinding stone. Simon Fraser University. Recently I spent the afternoon at Simon Fraser University in Burnaby, BC with lots of rocks. 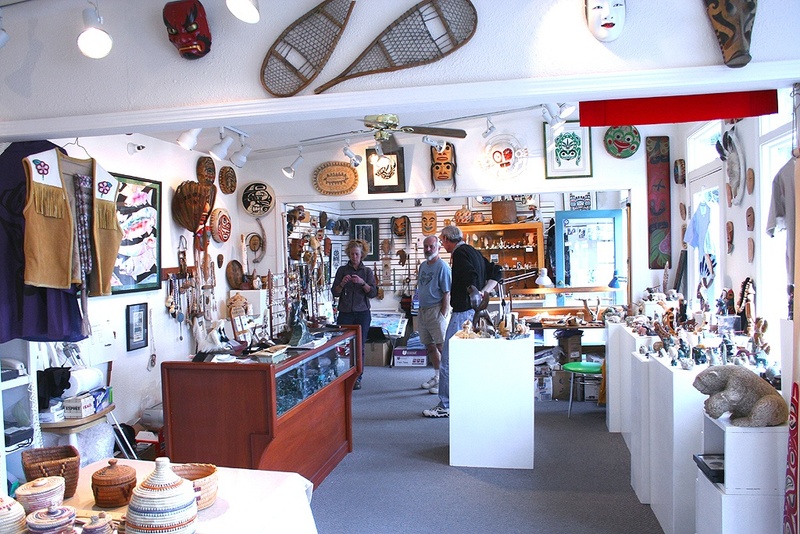 I’d been invited up by Dr. Roy Carlson, an archeologist who has been working digs in the Fraser River valley and delta, and much of the territory covered by the Coast Salish peoples for more than 40 years. I had specifically gone up to document and photograph two pigment grinding stones, one used for red ochre pigment, the other for a green pigment unknown to Dr. Carlson. The grinding stone with green pigment was unavailable, but I made good use of my time with these two other grinding stones. The photographs are of red pigment grinding stones dated at 3,000 years old which were excavated in 1984 in the Pender Gulf Islands, a group of islands between the San Juan Islands in Washington State and the Gulf Islands off the east coast of Vancouver Island. It is difficult to see that this stone in the photograph above is only a couple of inches thick and actually has a slightly concave surface upon which the pigment was ground. You can see two areas that appear to be whiter than the rest of the surface which are areas of deep abrasion. This second photograph is of a rough surfaced stone about the size of a brick that was used as a grinder. Fig 2. Rough surface pigment grinding stone. Simon Fraser University. The upper stone (Fig 1) would have had loose, probably granular pigment placed on it then it would be ground to a paste with another stone called a mortar. The lower stone (Fig 2) was most likely used to rub the pigment against. Often a solid piece of pigment was shaped into a crayon or other easily held shape by shaping it on a rough stone. What struck me immediately was the brilliance of the red ochre on both stones. Fig 1 shows a beautiful depth of color which indicates the red ochre on it is more oxidized than that on the other stone. These grinding stones were dug up more than 30 years ago; prior to that they had been buried for 3,000 years in a shell midden and shared the same environmental conditions throughout their burial. 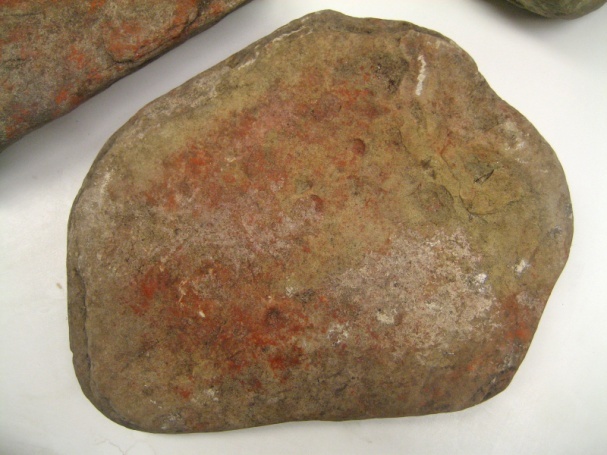 It is possible that the red ochre in Fig 1 was originally more oxidized than the other stone but there is no way to tell what hue (hue is a degree of color) the ochre was when it was originally ground. Any variety of environmental factors could be the reason these two stones vary in hue. It is fairly safe to say, though, that in the 30-odd years since they were dug up, the hue of red on each has oxidized to a more mature color. It is impossible to determine how long people have occupied the NW Coast and when the use of paint began. According to Dr. Carlson, the earliest cultural remains found so far are on Haida Gwaii and are dated at 11,700 years old. But due to rising sea levels many old village sites all along the coast have been inundated and may be lost to us forever. Archeologists are working under water, however, at sites that have been located which may push back the dates and give us a better idea of the early history of humans on the NW Coast. Fig 3. Worn and oxidized piece of hematite (top), raw new piece of hematite just starting to oxidize. Personal collection. I have many samples of red ochre in a wide variety of shades, tones, brilliance and intensity all lined up on a shelf, neatly labeled with the place of origin and the approximate date of when it was ground. One of the wonderful things about red ochre is it actually starts out as a dark metallic gray, rough stone that weighs far more than its size would indicate. 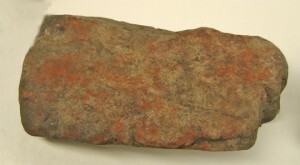 In Fig 3, the stone at the bottom is a raw piece of hematite which is starting to oxidize, showing a faint reddish color in some of the darker areas and a couple specks of red on the surface. The stone above it is a piece which has been worn smooth and the surface has fully oxidized. Internally, both retain the metallic gray color. I find it intriguing that red ochre is a transformational mineral, changing not only color but also state throughout its life. In NW Coast native cosmology, transformation is one of the consistent themes in oral history, stories and art. I believe that using materials that are transformational may have lent additional spiritual meaning to ancient people. Red ochre, the chemical name of which is Iron oxide, is simply an oxidized and decomposing form of hematite, with the same chemical formula (Fe2O3,). It is called red ochre when it’s used as a pigment. For other applications it’s commonly called iron oxide. This mineral is one of the most abundant minerals making up Earth’s crust and there is evidence of its use as long ago as 300,000 years1 but it appears to have become commonly used about 120,000 years ago during Neandertal times. Red ochre can be found in abundance around the world. It is one of the first two pigments to be used by prehistoric people, along with black, and unlike black which has been made from a variety of materials (coal, charcoal, magnetite, etc. ), red ochre has persisted in being the longest, most abundant and most consistently used mineral pigment throughout history. 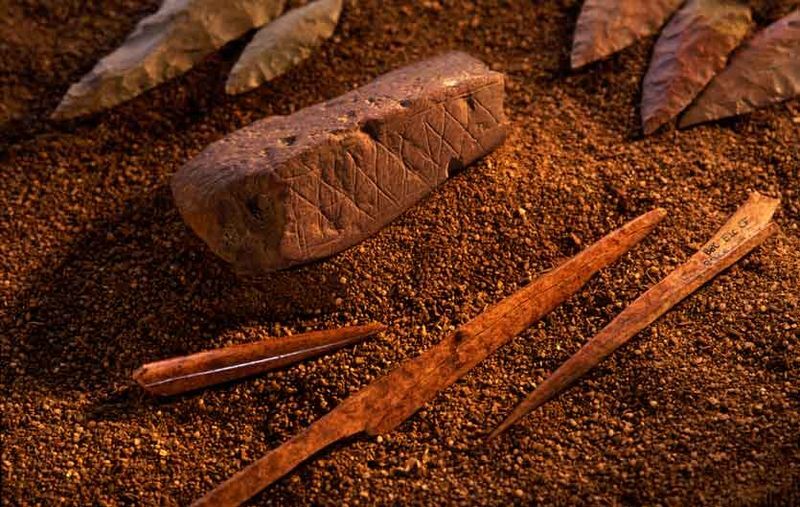 The oldest record of red ochre used as pigment is about 100,000 years ago in Bolombos Cave in South Africa where evidence of an ochre paint factory was discovered. There are an abundance of cave paintings (please Google “cave paintings” to see the astounding art created by our ancient ancestors) that attest to the constant and continued use of red ochre as the primary mineral red used throughout history. Red ochre throughout history has been used by almost every culture as some form of paint. It has been used as “…medication, both internally and externally, as a food preservative, for tanning hides and as an insect repellant.”2 Among almost every culture that had access to red ochre it was used as part of mortuary rituals and as body paint for ceremonial use. Personal conversation: Dr. Roy Carlson, retired professor of Archeology, Simon Fraser University, Burnaby, British Columbia. “Indian Art Traditions of the Northwest Coast”. Ed: Roy L. Carlson. Archeology Press, Simon Fraser University, Burnaby, BC. 1983. I found your article very interesting because I live close to the Pender islands on Orcas is just across the border. A few years ago archeologists found a chunk of red ocher in a village site here. I thought you would find that interesting.